"Please come to me my darling. Please." This is what an inebriated Mukesh said to lioness Radhika after jumping into the big cat's enclosure at Nehru Zoo Park, Hyderabad, on Sunday. Visitors at the enclosure raised an alarm after they heard a loud splash when the 35-year-old man from Rajasthan jumped into the moat, more than 12 feet below ground level. He waded towards the lioness waiting at the shore. A male lion, Krishna, soon joined the lioness and they eyed Mukesh. Visitors and zoo staff threw stones to distract the big cats but not before Mukesh had come within touching distance, reported The Hindu. "He was lucky, as the lions are usually wary of water. Given that these cats are human reared, they are tamer than wild cats and do not see humans as prey. Had it been the tiger's moat, Mukesh would have become fodder," said one of the zoo staff. 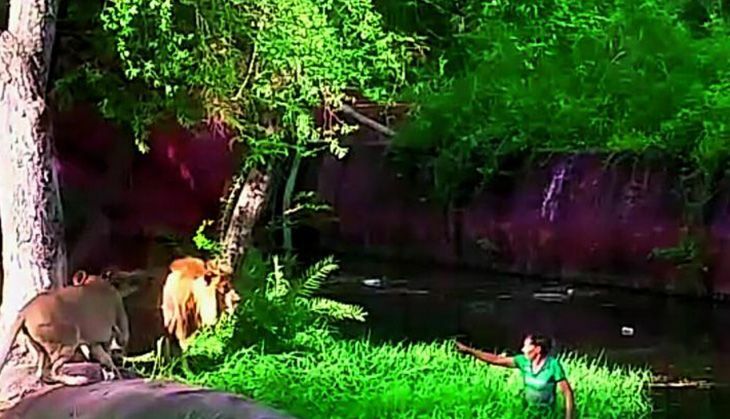 According to The Hindu, the lions got scared by the commotion created by the other visitors at the enclosure, who alerted Mukesh about the risk he had gotten himself into. The Zoo staff urged him to swim away from the cats and lowered a long pole for him to climb out. Even as Mukesh fled for his life, animal keeper Pappaiah softly called out to the cats. It was around 5 pm and time for the cats' feed. They responded to his calls. "Mukesh was lucky that he got away. He was completely drunk when he jumped in," a zoo official said. Angry visitors gave him a sound thrashing, as was witnessed from the videos of the incident that have gone viral. The zoo administration handed him to the Bahadurpura police. "When asked to explain his actions, he said he wanted to see the lion up close and shake its hand. We will question him again after he sobers up," said Bahadurpura Inspector Harish Kaushik. As reported by The Hindu, cases under sections IPC 448 and 38 F of Wildlife Protection Act (trespassing and teasing animals) were filed against him.